"Clark has done it againwith her uncanny ability to make complex ideas accessible to practitioners, the guidelines in this book provide an important resource for you to build your own online, problem-centered instructional strategies." 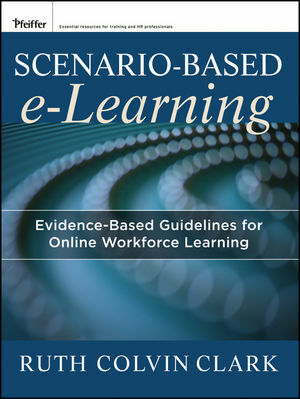 "Clark's wonderful book provides a solid explanation of the how, what, and why of scenario-based e-learning. The tools, techniques, and resources in this book provide a roadmap for creating engaging, informative scenarios that lead to tangible, measurable learning outcomes. If you want to design more engaging e-learning, you need to read this book." Dr. Ruth Colvin Clark has worked for over 20 years with training professionals assigned to design, develop, and select effective training for classroom or computer delivery. She is widely published in training and performance improvement periodicals and was recently bestowed a Distinguished Professional Service Award from ISPI. She is the co-author of the best-selling e-Learning and the Science of Instruction. Scenario-Based e-Learning and You: Why Now? Chapter 10: Does Scenario-Based e-Learning Work? What Features Make a Difference? Can Scenario-Based e-Learning Accelerate Expertise? Which Elicitation Method Should You Use?